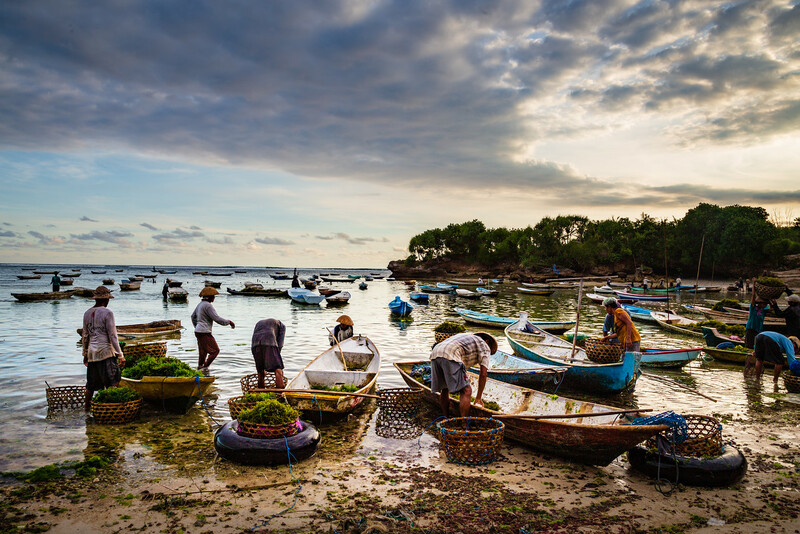 There are times when you see a scene and you know it would make an amazing photo story and knew this right away with Nusa Lembongan Seaweed Farming. 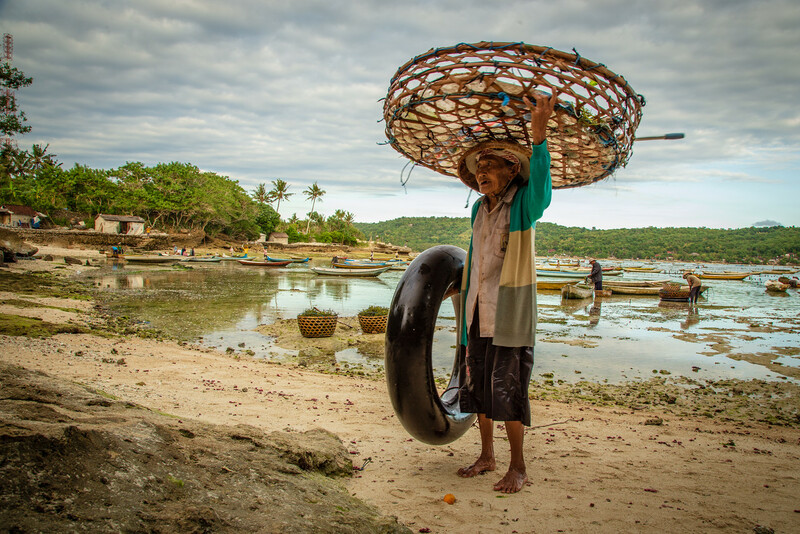 Last fall when I was visiting Lembongan Island, Bali, Indonesia for the first time I came across seaweed farms. As a westerner, from a so-called developed country, I never really gave much thought to seaweed. It was one of those things that I knew had at least marginal value as Nori (wrappers for sushi) and at the periphery of my awareness I knew that it used as additive to food and cosmetics. But, like so many things, I took it for granted and never gave any thought. Amazing there are a whole group of real people working their asses off, for pennies a day, to provide me with a stable foam on my beer. Farming seaweed is hard work. 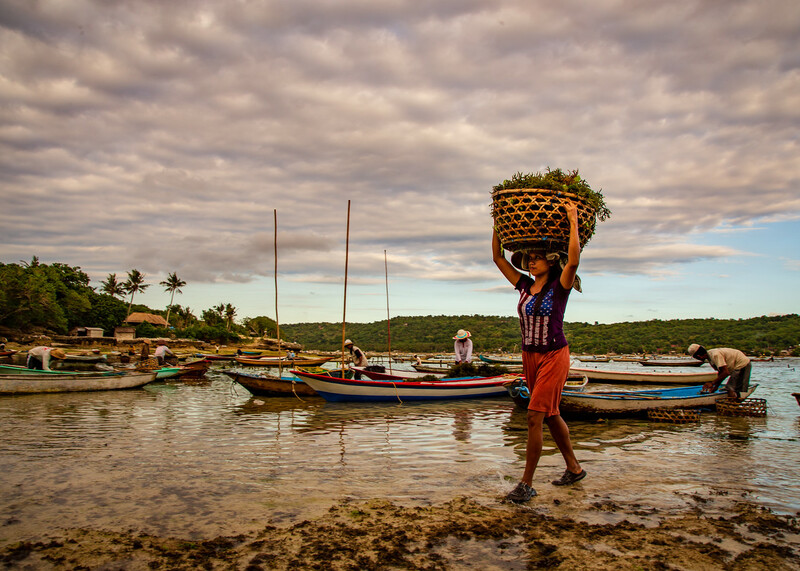 The crop can only be tended at low tide so instead of synchronizing your life with calendar and clock, you synchronize your life to the rhythms of nature and the tides. If the tides are out during the day you get to do back-breaking work in the heat of the sun. If the tides are out at night you get to struggle under lamplight until the tide rises or your work is done. 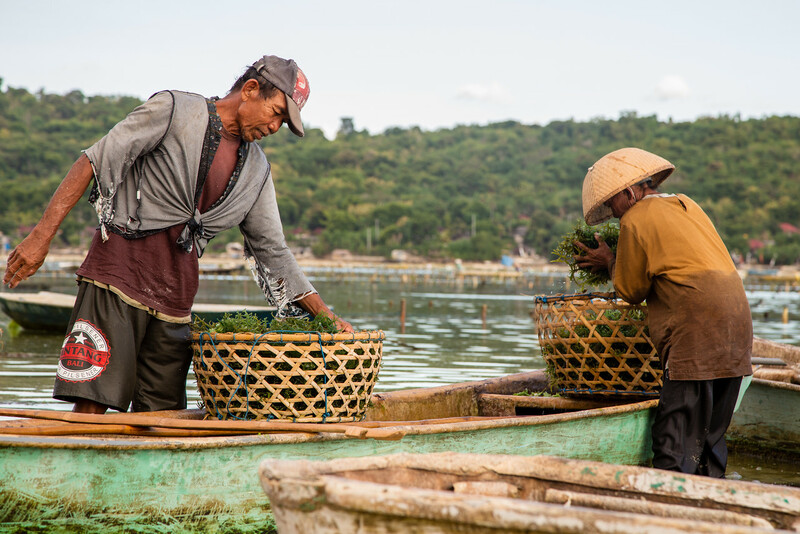 Different types of seaweed grow at different rates so you have to decide whether to grow the fast-growing, but less valuable, brown seaweed or grow the other more valuable variants that take longer to grow. 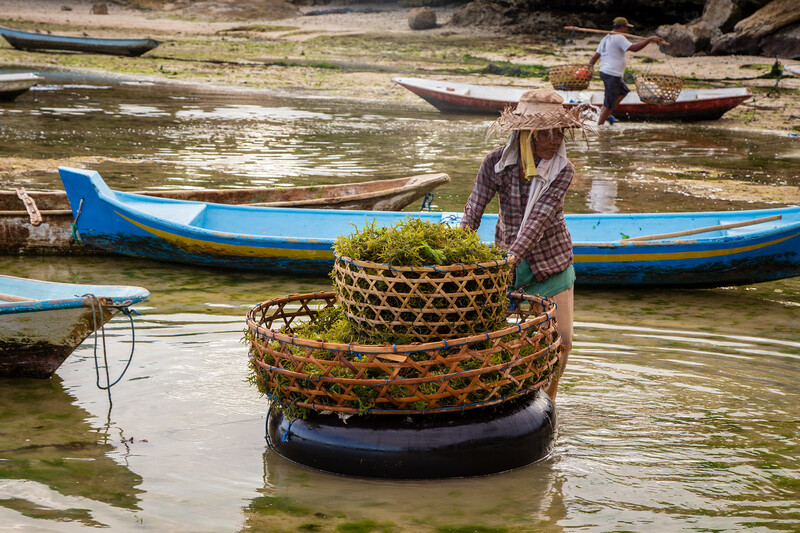 Small-scale commercial seaweed farming is also pretty complicated. As if that wasn’t enough to worry about climate change is starting to have an impact on yields and, even in remote Indonesia, globalization and fickle market forces reach uninvited into your life and determine whether or not you make even a meager profit from your 10-meter by 10-meter plots of marshland. 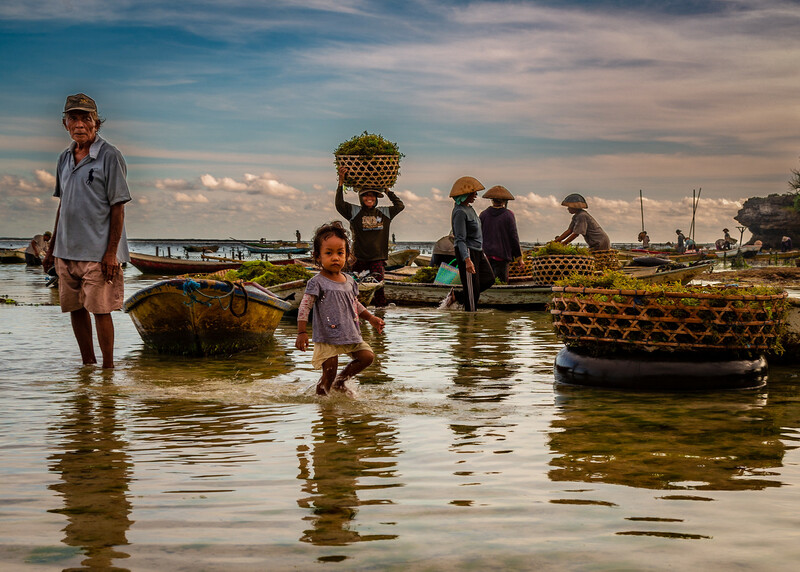 Sadly on occasion when yields and prices are low, seaweed farmers are forced to eat their crop for sustenance. When times are great they can make enough to eke out a lesser level of poverty. 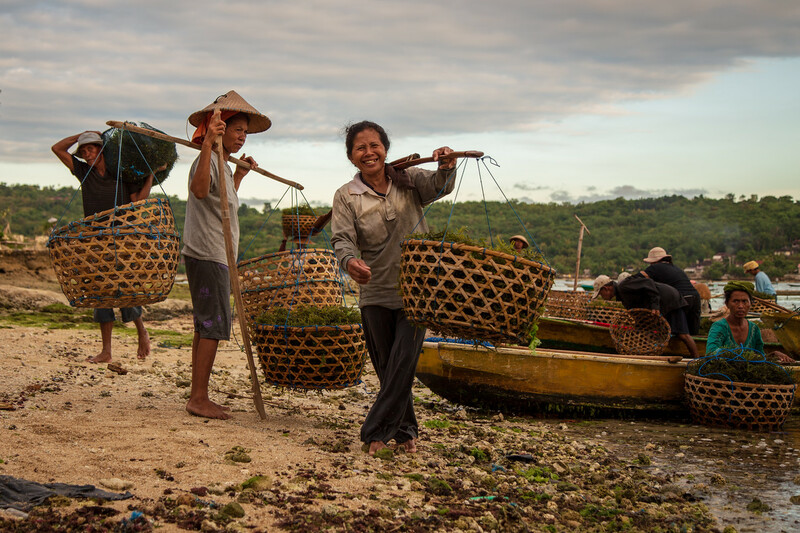 Collectively the seaweed farmers on the three Balinese islands of Nusa Lembongan, Nusa Penida, and Nusa Ceningan used to produce of 40 tons of seaweed a month, but changing weather patterns have dropped the yield to around 25 tons. The seaweed has not been growing normally and much of it dies and begins rotting in the sea before it becomes ready to harvest. What Does it Cost to Stay on Bali for a Month? As a photographer, I was lucky because “golden hour” coincided with low tide. I just took my equipment out and started making photos. Even though I was uninvited, after a period of warming up, I was soon accepted, tolerated and even welcomed. After a while, some of the farmers started laughing with (at) me and wanting to pose just for the novelty of being noticed and having their picture made. I guess they weren’t used to seeing people wading out into the water to see their work, connect on a human level and take an interest in their lives. I was elated. Once again I was humbled. A reminder of how privileged I am and how lucky I am to be enjoying this little retirement adventure I call life. As always Jonathan you have some great photos. 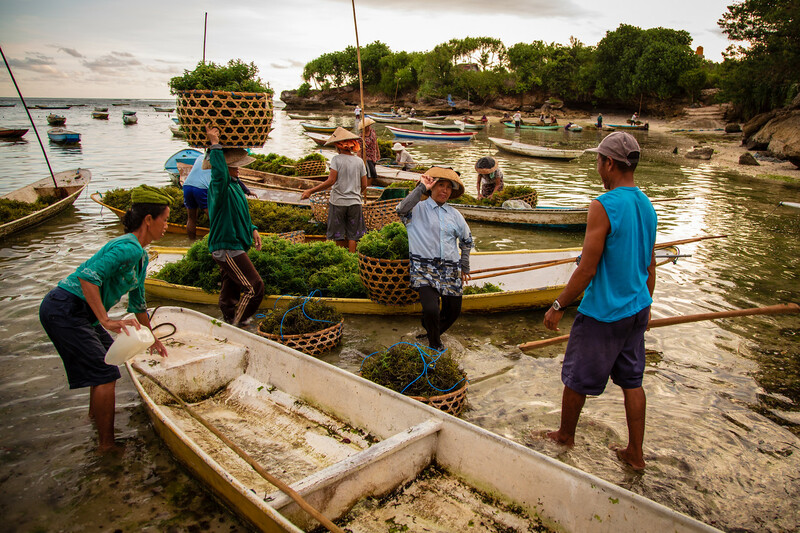 I went to Lembongan a couple of years ago and like you had never really placed a value on seaweed. Like land weed it didn’t occur to me that it could be used for much. Seeing how hard the folks worked to gather, sort, dry, and pack the weed made me feel lucky. That happens a lot when traveling through developing nations and it is a humbling realization. I was exactly in the same place in late February. Me and some fellow travelers went there by scooters. We spoke to locals, chilled out and had a nice breakfast. These people are so hard-working. Great pictures!